When Jack entered upon the dangerous duty of ranchman, he expected trouble with the Indians, and was, therefore, prepared for it. Nor was he in anywise sur­prised when, a few months after his engagement, a large body of the red-skins came down upon him and his part­ner, with whoop and weapons, intent upon capturing the horses under Jack's charge. But the Indians were re­ceived with a cordiality little expected. Jack at once covered the rear, and while his partner drove the horses rapidly toward National Monument, Jack poured a deadly fire into the Indians, killing several, and thus checking pursuit. For this skillful and effective resistance he was well rewarded by the owner of the stock. Afterward Jack made several cattle drives to Abilene, and became one of Texas' most renowned rancheros. When the great civil war was declared, and there was a mustering of Southern forces through the Southwest, Jack proffered his services to Gen. Floyd, by whom he was at once made "headquarters courier," and directly thereafter was promoted to chief of scouts under the celebrated cavalry Colonel, J. B. Stuart. He served in this capacity for several years, and became noted throughout the Confederacy. At the close of hostilities Jack was employed as guide between the Colorado and Rio Grande rivers, and after pursuing this calling for several months made an extend­ed tour through Kansas and Nebraska for the purpose of so familiarizing himself with the country that he could competently guide parties through those territories (now States). In 1872 Jack was engaged as scout for the Government and in the following summer had charge of four hundred Pawnees who were engaged to operate against the Chey­ennes. 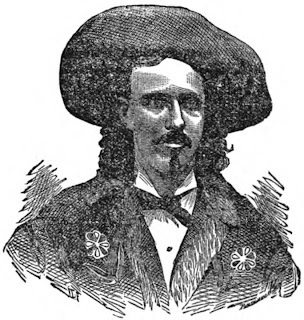 It was while thus employed that he made the ac­quaintance of Buffalo Bill, with whom he scouted a con­siderable time and until the two became partners in an enterprise conceived by Ned Buntline, as detailed in the Life of Buffalo Bill. While Gen. Sheridan was organizing his campaign against the Northern Cheyennes, Jack was employed as hunter for the army, in which capacity he developed re­markable skill in killing antelope, which abounded on the prairies of Western Kansas at that time. The method employed for killing this most wary and fleet of North American game is well portrayed in the accompanying engraving. The killing of antelope is not so exciting as that of buffalo hunting, but it requires great caution and has much of genuine sport in it. During the Cheyenne war, and at the time of Custer's death, Jack was employed by the New York Herald to carry dispatches from the scene of hostilities to the near­est points for transmission, and performed these duties with such satisfaction that he received many flattering no­tion of praise from that paper. In the early part of 1880 Jack's health became much impaired, and he went to Colorado with the hope of benefitting his physical condition and also his fortune, as the Leadville gold and silver discoveries were then promising large returns for small investments of capital and labor. But his anticipations were never realized, for in May he was attacked by pneumonia, a disease of great prevalence in the rarified atmosphere of that high altitude, and in June following he died. His wife, who is known on the stage as M'lle Morlacchi, was with him during his illness and nursed him with all the care and tender attention that a devoted wife could give. Texas Jack was a true exponent of Western civilization: courageous, true to his friends, unfaltering in the line of duty and resolute under all circumstances. His grave is among those whose adventurous spirits led them to the auriferous fields of Leadville only to lay down their hopes and burdens beside the still waters and peaceful fields of death ; but it is kept green by friendly hands, while his name is ever fresh in the memory of companions who cherish the traits of his noble manhood.